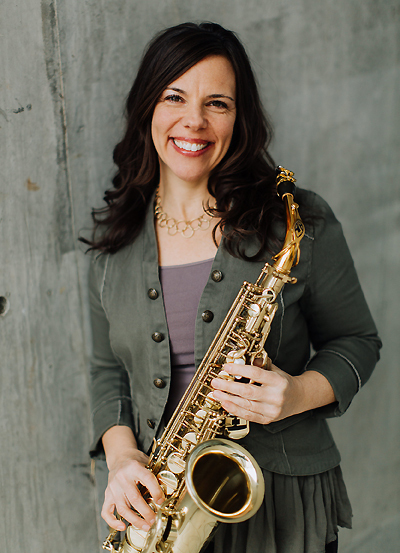 Saxophonist Dr. Connie Frigo is an accomplished soloist, chamber musician, teacher, speaker, and founder of numerous festivals. She is sought-after presenter on topics relating to professional development, entrepreneurship, creativity and women in music. She is currently Associate Professor of Saxophone at the University of Georgia where she has taught since 2011, and inaugural Chair of the North American Saxophone Alliance's Committee on the Status of Women. Highlights of Frigo's career include six years with the premiere U.S. Navy Band, Washington, D.C., a position she won as a junior in college; seven years touring nationally as the baritone saxophonist with the New Century Saxophone Quartet; and faculty positions at the Universities of Tennessee, Maryland and Ithaca College prior to UGA. She is a Fulbright Scholar to the Netherlands, where she studied with Dutch virtuoso Arno Bornkamp and began a lifelong collaboration with Dutch 'avant pop' composer JacobTV. Frigo is an active clinician and guest performer at universities domestically and internationally and appears regularly at national and international conferences. In recent years, she has traveled to Italy, Russia, Brazil and Panama to perform and teach. She has served on the faculty of the American Saxophone Academy at the Eastman School of Music, the Great Plains Saxophone Workshop in Oklahoma, and the Dakota Chamber Music Festival. In August 2017, her trio, The Yargo Trio, featuring Angela Jones-Reus (flute) and Liza Stepanova (piano), released their debut album Voices, Reimagined, produced by Mark Records. Frigo's students have won concerto, young artist, and chamber music competitions at national levels. Her research on the discipline of creativity and the impact it can have on the learning and teaching of classical music has led to new teaching strategies for the applied studio. She was a UGA Center for Teaching and Learning Fellow for Innovative Teaching, with a focus on "Flipping the Classroom." While teaching at The U. of Tenn., she was voted Distinguished Teacher of the Year by the student body. With a special interest in collaborating with living composers, Frigo has been a part of commissioning and premiering the works of many composers including JacobTV, Bang On a Can co-founder David Lang, Ben Johnston, John Fitz Rogers, Joel Love and Peter van Zandt Lane, among others. In 2019, the Yargo Trio will premiere a new work written for them by Lowell Liebermann. Frigo is a Henri Selmer Paris artist and D'Addario artist. For the North American Saxophone Alliance, she has served as Coordinator of Competitions (2007-2010) and program committee member and chair (2012, 2014) for the biennial conferences. Her degrees are from Ithaca College, the University of Illinois, Conservatorium van Amsterdam and the University of South Carolina.